I have a question about the colts. When is the decision typically made whether to geld or leave them intact, and what factors go into that decision? 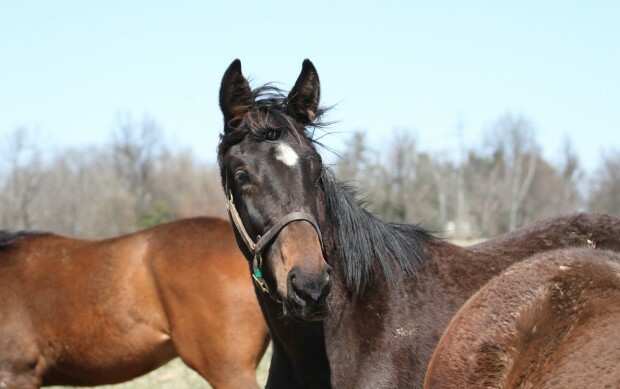 A:Typically we will never geld a colt before it leaves the farm, either for the sales or to be broken in, unless there is a medical issue involved. We often have a good idea that they may become geldings fairly soon into their training careers though! Some colts are definitely more “studdish” than others. Buyers usually don’t want to purchase a yearling gelding, as this will often indicate they have a difficult temperament. On top of that, this is a dreamers game—when someone buys a colt they like to think they have a shot at owning a horse that will have a stellar racing career and go on to leave his legacy as a stud. Some of the colts that are headstrong and studdish as yearlings improve once they are in training and they have a job to do. With the horses that don’t settle down, it becomes a question of whether you can get the horse to train and race to his full ability if his mind is not on the game and he’s fractious and difficult to handle. If the answer is no, then often he will be gelded at this point. The other reason to geld a colt is if they are clearly not going to compete at the levels that would then lead to a career at stud. A gelding is usually easier to handle and deal with on a daily basis. I know a lot of people will say they have had difficult geldings or easy colts, and of course that can be the case but generally it’s easier to have a gelding in the shed row, especially when there are fillies in the barn. Cooper was born in Lexington, KY and graduated from the University of Kentucky with a degree in Agriculture. He started working with horses in 1997 in the training barn of Al Stall Jr. Before coming to Lane’s End as the Yearling Manager in 2010, he worked at Wimbledon and Mill Ridge Farm. I may be dating myself but those out there who ever worked with a Round Table colt knows what studish really is! Lol! WHAT IS THE STATUS OF Z12? How does the Bernadini yearling look? Two comments. Does Z still have to wear shoes? I remember years (too many to tell!) but we lived in the country in California and we never had shoes, just had the guy trim their hoofs. The other one is to find out if Z going to be bred this year? I hope she gets a rest. Thank you and Z and your second one are absolutely gorgeous. Can’t wait to see Coz out on the track! Im really looking forward to his career!! Coz,we all think of you often and wish you the best. Run free in your paddock for as long as you can,then when it is time may you be brought along slowly in a way that never breaks your spirit or your health. I hope you will be a 3 year old,like Zenyatta ,before you race and have lots of time to mature and develop in a helathy way physically and mentally. You are so aware and tuned in,may your people always tune into you. What a very interesting lesson on breeding if you take the free 5 X Pedigrees on Equibase of Bernardini, Tapit and Zenyatta. If one can arrange it looking at the conformation pose photos of each, at the same time would be wonderful! What a lot to learn and to think about! Hi when will Cosmic One be 3 years old?